Nontetha Nkwenkwe is one of the most remarkable female religious leaders associated with independent churches in the 1920s. Born in King Williamstown in 1875, Nontetha was married with ten children. Her migrant labourer husband died, leaving her to fend for her children. Following the outbreak of the influenza epidemic in 1918, Nontetha believed that she was spared for a divine purpose. And in undertaking her work as first a seer, then a diviner, and ultimately a prophet, her life was changed dramatically. At first Nontetha was welcomed by the authorities, unlike some of her contemporary male counterparts like Enoch Mgijima. In fact, authorities welcomed her as they understood her sermons to be encouraging her congregation to abstain from alcohol consumption, dances and other traditional customs. Unhindered by the authorities, Nontetha’s movement grew rapidly in rural Ciskei, East London, Middledrift and King William's Town. The arrest of Nontetha enraged her supporters. In a show of solidarity, hundreds of her supporters gathered, ready to engage the authorities in the event that their heroine was charged. Mindful of the disorder that could be unleashed by a possible court appearance, the authorities committed Nontetha to Fort Beaufort Mental Hospital and, in 1924, transferred her to Weskoppies asylum in Pretoria. And when, two years later in 1926, nothing had been said about what her fate would be, her devotees walked 600 miles to see her, but were arrested and charged under the pass laws. In 1930, a second delegation was immediately loaded onto a train and sent back to the Eastern Cape. Protests from African groups and white officials alike were ignored, and she spent the rest of her life there, dying in terrible isolation in 1935. Nontetha had such a significant impact in the Eastern Cape in the 1920s that it is strange so little is known and written about her. But among her contemporaries, she was revered. She was to attract many local women (especially diviners) to her cause and they soon became prominent in her Church of the Prophetess Nontetha, which still exists today. The church enabled women to articulate gender and generational concerns, while their prophetic role offered the prospect of enhanced status. 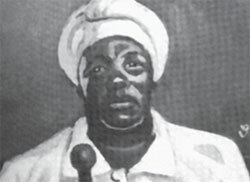 By the 1920s, Nontetha had gained immense respect in African society, for she was not only a respected seer and herbalist but also a middle-aged and fully initiated woman and household head. This admiration and respect from Africans in the region contrasted sharply with official perceptions of her. In the eyes of the authorities, Nontetha was an unstable psychiatric patient who needed to be removed from society and held in isolation and confinement. Yet, neither Nontetha’s family nor her followers ever accepted the claim that she was deranged. Even her African opponents never described her as mad (ubugeza), but rather as subversive. • R. Edgar, H. Sapire. African Apocalypse: The Story of Nontetha Nkwenkwe, a Twentieth-Century South African Prophet. Athens, Ohio and Johannesburg: Ohio University Press, 1999.